Team Sky’s Ian Boswell rode incredibly strong during the epic Stage 11 of the Vuelta a Espana on his way to 3rd on the stage. Take a look at his power numbers from that stage to get an inside look at how hard this stage really was, and how hard Boswell had to go to be on the podium. View Boswell’s full Stages power file. Immediately, this stage started out hard. Starting just 5km in, Boswell set his Peak 1 Hour Power of 332 watts, or 4.88w/kg. while ascending the Category 1 Collada de la Beixalis and half of the Category 1 Coll d’Ordino. During this same strech, Boswell set all of his peak power values under one hour. This section is also where Boswell made it into the main break of the day. After a 25 mintue descent, Boswell again put in a big effort. Climbing the Category 1 Coll de la Rabassa and the HC Collade de la Gallina, Boswell put out his Peak 90 Minute Power of 312 watts, or 4.58w/kg. and averaging 79 rpm. Having ridden for four hours at an average of 284 watts, Boswell came to the final climb of the day, the Category 1 Alto Els Cortals d’Encamp. For 40 minutes his Normalized Power® was 339 watts while averaging 20.3km/h. Boswell’s Peak 1, 1:30, and 2 hour power values have very little overlapping sections. This is very rare and shows how hard the day was from start to finish. Over the full stage, Boswell climbed 4724m (15,971 fteet) averaged 295 watts, 82rpm, 29.1km/h, and burned 4868 calories. 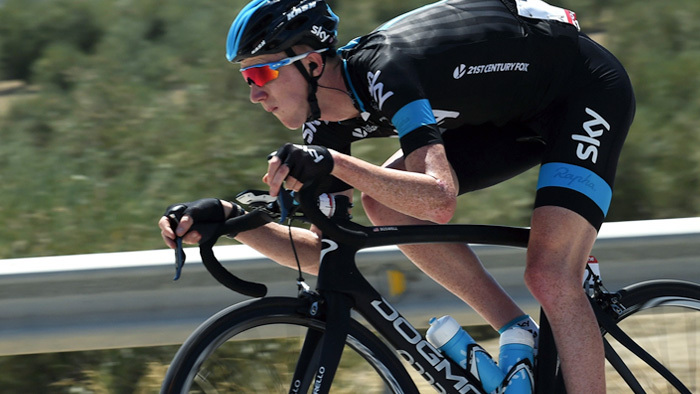 Read more about Ian Boswell from the 2015 Tour of California.